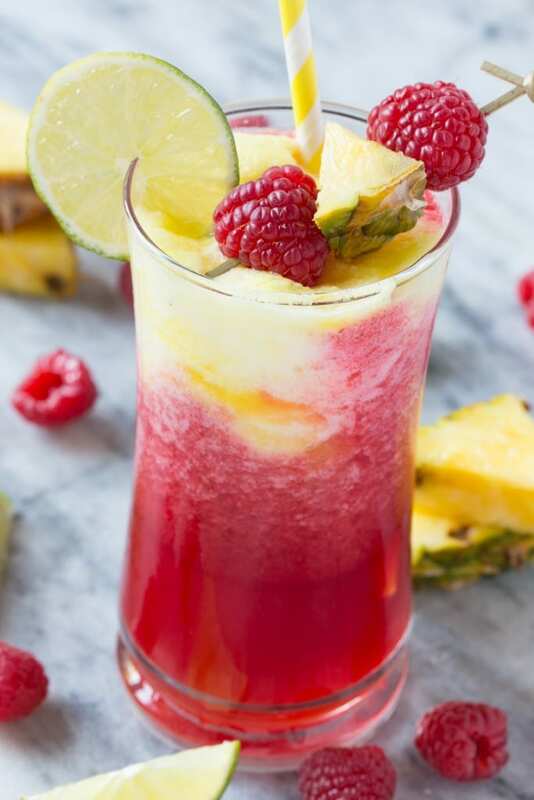 This sparkling raspberry pineapple freeze takes frozen fruit and blends it with sparkling water for a festive and refreshing beverage. A delightful tropical drink that will make you feel like you’re on vacation! Add a splash of rum to turn it into a cocktail. As a busy mom it’s important for me to stay hydrated. Sometimes I get so wrapped up in daily life and caring for the kids that all of a sudden I stop and realize that it’s been hours since I had a drink of water, or did I forget to eat lunch? Let’s face it, water is clearly a necessity, but sometimes it can be a little…boring. 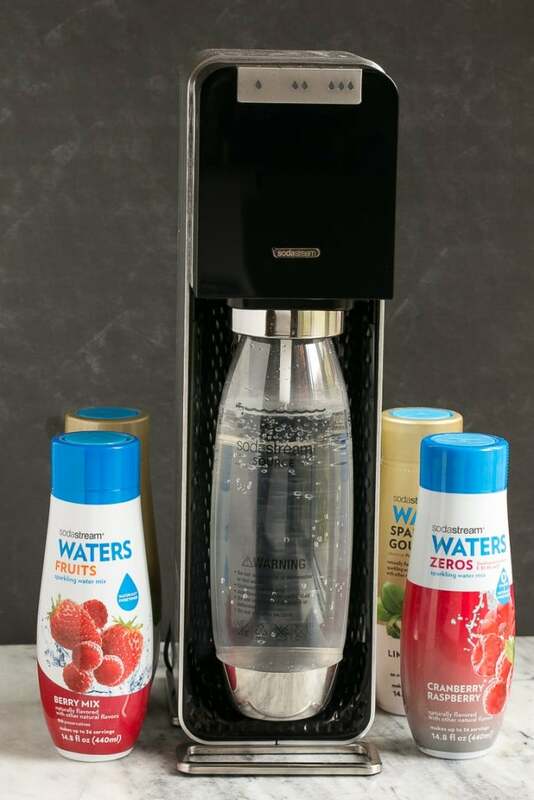 Enter the SodaStream Power Automatic Sparkling Water Maker – this machine creates sparkling water in seconds with a simple touch of a button. Since we got our SodaStream Power the whole family has been drinking more water and the kids love watching the water carbonate before their eyes. After you’ve got your sparkling water you simply add a splash of flavoring for a drink that’s anything but boring. SodaStream Sparkling Drink Mixes are made with all natural sweetners which is always a plus in my book. Right now my favorite flavor is the Berry Mix and the girls are loving the Blackcurrant Lime. 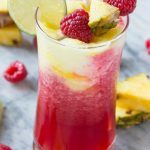 We’ve been enjoying our sparkling water so much that I decided to take things a step further and make a refreshing and festive raspberry pineapple freeze that’s perfect for entertaining. 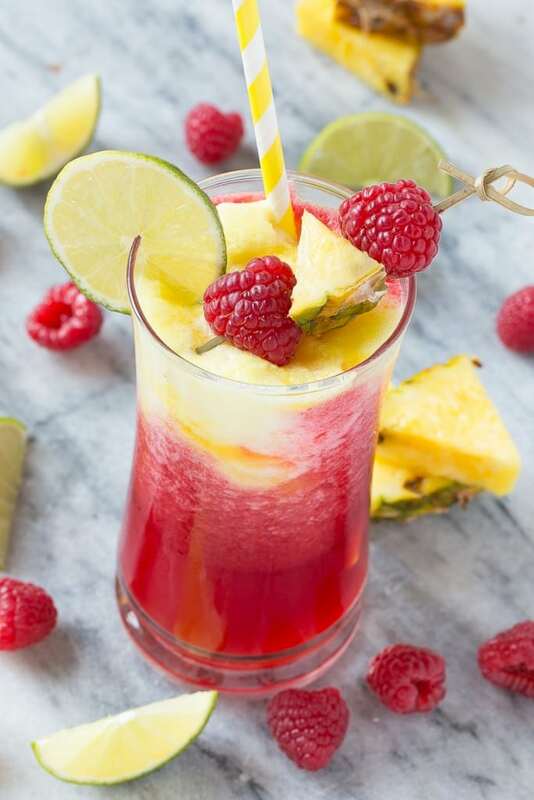 This layered drink looks really impressive but is quite simple to make – all you really need is sparkling water and frozen fruit! The first step in the process is to make the raspberry base. I used sparkling water flavored with the SodaStream Sparkling Drink Mix in the Berry Mix flavor and blended it with frozen raspberries. Next I made a pineapple slush with frozen pineapple and SodaStream Sparkling Drink Mix in Lime Basil flavor. 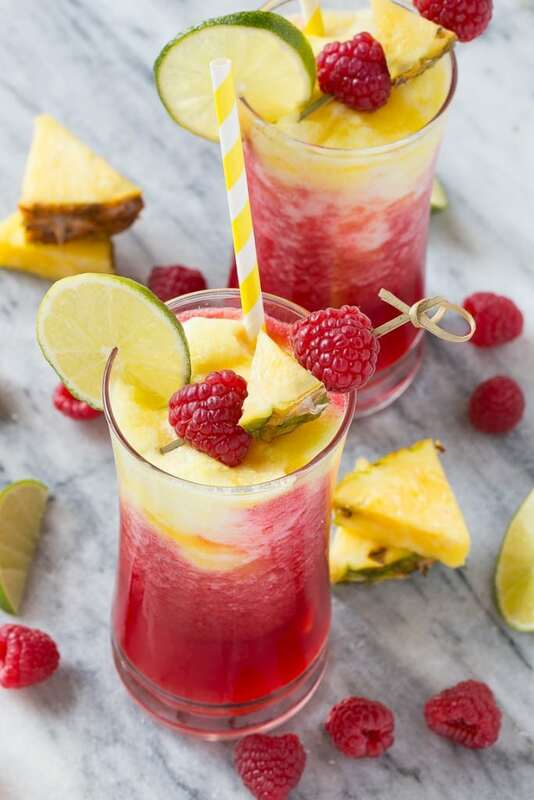 In order to get the drink to look layered, the pineapple mixture needs to be frozen to a mostly firm consistency so that it will sit on top of the raspberry drink without sinking to the bottom. I did not add any additional sweetener to this drink, but if your frozen fruit is on the tart side you can always add a touch of honey. Don’t have a SodaStrem? 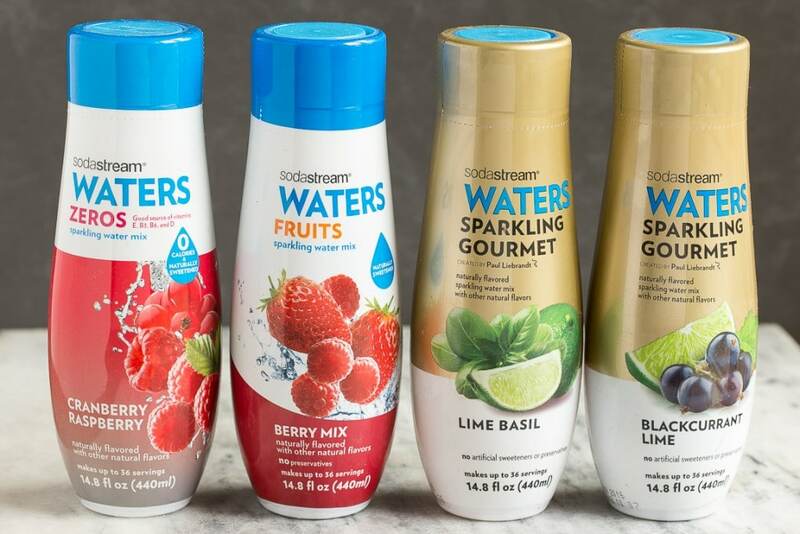 Simply purchase berry and lime flavored sparkling waters at your grocery store. To me this drink tastes like the tropics, which is always a welcome thing in the middle of winter! The bright colors make it a fun yet unexpected drink for the holidays. Speaking of the holidays, I bought a SodaStream Power for my parents, I know they’re going to love it. Do you have any tips or tricks to make sure you’re drinking enough water every day? I’d love to hear them! In a blender mix the berry sparkling water with the frozen raspberries until smooth. Taste and add honey if needed. Pour the drink through a strainer to remove the raspberry seeds. In a blender combine the lime basil sparkling water with the frozen pineapple until smooth. Taste and add honey if needed. Pour the pineapple mixture into a shallow container and place into the freezer. Place the raspberry mixture in a pitcher in the refrigerator. Freeze the pineapple mixture for 30-45 minutes until it reaches a slushy consistency. Pour the raspberry mixture evenly into 4 large glasses. Spoon the pineapple mixture on top of the raspberry drink. Garnish with lime slices, raspberries and pineapple if desired. Thanks for sharing! Can I make a concentrate and put in fridge? This drink was fantastic! I got a SodaStream for Christmas so I tried this drink. Sooo refreshing! This looks so good! 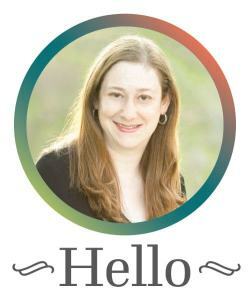 Love your blog name that is what dinner time feels like here at my house with two rambunctious boys! Oh no! I swear you’re trying to torture me as this looks fantastic and just what you need after a hard days work. Very pretty and festive drink. Love the layers! I love my soda stream (so much that I bought a FRIDGE with one built in, ha!). I drink soda water plain all day long, and I love the flavors for cocktails or just a refresher… this sounds SO good! Okay, time to get a SodaStream! Yum. This is absolutely beautiful – I love that layered look! And the fact that there’s no alcohol is great so they’re kiddo-friendly too! I’ve been thinking about a soda stream. Now you have me wanting one for sure.